It is important to me to raise active kids and I do more than lead by example. It is my goal to see them happy and active and enjoy all the benefits being active affords them well into their adult lives. They do not participate at a competitive level in anything, but they do a bit of everything – my kids ski, skate, dance, gymnastics, play soccer, make the school volleyball team, take swim lessons, and bike everywhere they can – and they run. Our family has been running races together – for fun – for about 5 years and theough this my kids have learned the value of setting goals, practicing a bit, and challenging themselves to run a bit faster or a bit longer at their next race. They continue to surprise me. I may practice with them and teach them what I know about running distance, but the love of the challenge and achieving the goals is all theirs. They each have a growing collection of finish line medals and are so incredibly proud of themselves every time they run a familiar distance in a faster time than the race before. Especially after today. Today all 3 of my kids – age 8, 10, 12 – were excited to run a race they have watched me do every September. 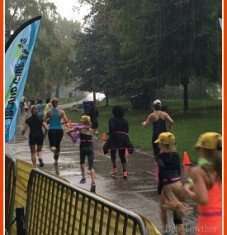 The Island Girl Half Marathon on Toronto Island is one of my favorites and my husband and kids come to cheer me on – it is a family affair even if only one of us is running. This year they were determined to run the Island Girl 5km run while I ran the half marathon. But the forecast was rain. We weren’t going to drive to the Toronto Island ferry if it was raining but we did – thinking the rain would stop. And it did – for a few minutes just before the race started. But as the racers gathered at the starting line the rain came down hard. When the gun went off to start the race, the skies opened and it RAINED HARDER. My 3 kids took off. IN THE RAIN. The POURING RAIN. On their own. No one to pace them or make sure they got water. We usually run events as a family with my husband and I splitting the run – one of us stays with the faster kid and one with the slower kid while the middle runner is on her own knowing we are in front and back. Today they were on their own and it was raining. I asked them at the start line if they were sure they wanted to run – they didn’t have to. Rain is not that enjoyable to run in; soggy socks, rain in your face and dripping off the brim of your hat. But they wanted to run. I imagined the youngest sad after 2km of being alone and cold in the rain, I was certain my 10 year old would be afraid of the impending thunder (not her favourite) and I thought perhaps the oldest would hang back and make sure her sisters were OK and not really run the race. I could not have been more wrong. The rain was “fun” to run in they said and not only did all 3 finish with smiles on their faces but they all made their goal time. Two of them in the 30 minutes they had hoped for, and my 10 year old had her personal best time of 26:54 for a 5km run! Fast enough to earn her 8th place OVERALL. Not just 8th out of the few kids who were running . . . but 8th place of ALL the adults that entered the 5km Island Girl run. 120 racers and my 10 year old came in 8th! My 8 and 12 year old? They came in 20th and 21st. Did I mention it was POURING rain and they were running on their own? I still can’t believe they decided to run the race, never mind how excited they were to tell me when i saw them during the 11th kilometer of my race. If ever a Mom needed to hear some encouragement to keep HER running and finish her own 21km half marathon in the POURING RAIN it was today. Those kids got me through to the end of my run (when of course the sun finally decided to appear! ), just so I could hear again how happy they were to have been out there on a race course in the pouring rain. Just shows that as parents we never know what accomplishments lie within our kids. It is up to us to share with them a lifestyle of being active, to give them opportunities to shine and see what they are good at, to teach them how to set goals, how to practice and how to be proud of everything they achieve. Today they each felt pride for themselves and for each other – they know they did something amazing today. Their Dad and I are crazy proud, we are raising some pretty incredible kids who happen to be good at running in the rain!